I’ve been feeling very wanderlust-y for Italy lately, so for Meatless Monday I’m recommending Cacio e Pepe (pasta with cheese and pepper), a popular Roman dish. This pasta embodies the elements I miss most about authentic Italian food- the ingredients are simple and few, and the dish doesn’t take skill so much as finesse, an innate sense about proportions and timing. There are varying opinions on what fat to include in the recipe, if any. You can use butter, olive oil, cream, none of the above, all of the above. 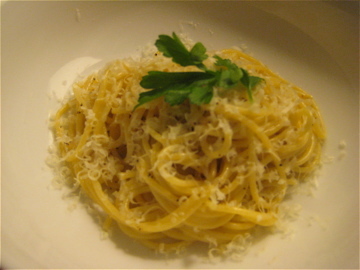 Some recipes use just Pecorino Romano cheese (the most traditional), some use both Pecorino and Parmigiano Reggiano. Personally, I’m not crazy about Romano, whereas Parmigiano is one of my top ten favorite foods. I think the trick to Cacio e Pepe is whisking your sauce ingredients before adding them to the pasta. This gives you a smooth, even consistency, while just dumping everything in with the spaghetti and stirring can lead to lumps. Below, my recipe for an Italian favorite. Liberally salt boiling water before adding pasta, cook for 8 minutes (or until al dente). Before draining pasta, reserve 1 1/2 cups of cooking liquid. Drain pasta and set aside. Put 2 1/2 cups grated cheese into a bowl and slowly add 1 cup pasta water, a little at a time, whisking to combine. 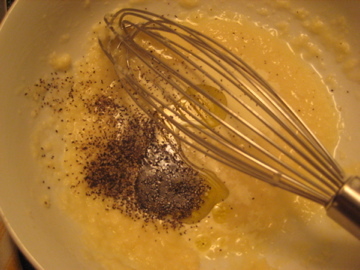 Add cream, olive oil, and pepper, whisk all ingredients together. Add sauce to pasta, stirring to coat. 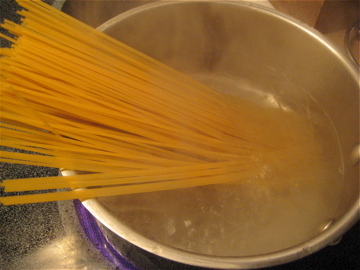 If sauce is too thick, add more pasta water to adjust consistency. Top with extra grated cheese, if you are so inclined.